Gordon West was born in Darfield near Barnsley in 1943 and went to the same local school as Mark Jones, the Manchester United centre-half who was one of the Busby Babes who so tragically lost their lives in Munich. As a schoolboy West, the son of a miner, followed in Jones’s footsteps and was a centre-half himself, skippering the school team from that position. 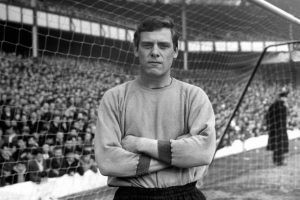 In 1958, the day after his 15th birthday he accompanied a teammate from the Don and Deane Boys Club to a trial at Blackpool, made the fateful decision to try out as a goalkeeper and was snapped up by the Lancashire club. West spent seven weeks on trial at Bloomfield Road before being offered a groundstaff post, eventually signing as an amateur. 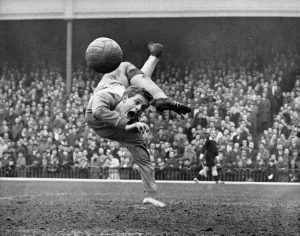 He got his first opportunity in March 1959 when another local club, Fleetwood, had a goalkeeping crisis and took him on loan. He made his debut in a 3-0 win over Bacup Borough and put in a ‘faultless display’. West’s undoubted promise was being noted at national level and he made his England youth debut in a 1-1 draw with Scotland at Newcastle. He would go on to make 6 more youth international appearances for his country. West signed his first professional contract in April 1960 with the terms being £10 in winter, £9 in summer and an extra £10 if he was chosen for the first team. By the time he was 17 manager Ron Suart decided he was ready for the first-team and he made his first team debut against Aston Villa at Villa Park on 31 December 1960 replacing Tony Waiters, who had himself taken over from long-time custodian George Farm. 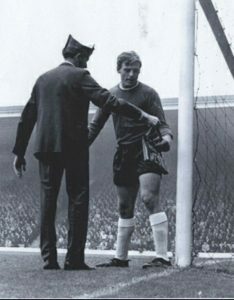 Villa took a 2-0 lead with a brace from Gerry Hitchens, the second of which West would later claim he should have saved. But Blackpool fought back to claim a 2-2 thanks to a late equaliser from Roy Parry and the young ‘keeper was praised in the press for ‘an impressive debut in which he showed the confidence of a veteran’. West kept his place until the end of the season, ending up playing 19 league games as Blackpool narrowly avoided relegation, and his reputation quickly grew. His increased status was recognised after the season when he was given a pay rise to £25 per week with an extra £5 when playing in the first team. At the start of the 1960-61 season West kept his place in the first team until he was dropped following a defeat at Arsenal, a match which was also Stanley Mattnhews’s last for the club. By this time there were reports that at least one other First Division side wanted to sign him. West and Waiters were top-class ‘keepers, and both future England internationals. In March 1962 Suart, realising that the pair were capable of performing at the highest level and understanding that West wanted first-them footbll, sold him after just 34 games for the Tangerines to Everton whose boss Harry Catterick who had offered £28,000 to make him his first signing. The transfer fee was a then-record for a goalkeeper and one which the Blackpool Gazette claimed ‘would never be broken’. West celebrates Everton’s title success, from the stand. 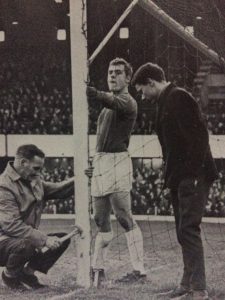 At Goodison Park West competed with long-time first choice Albert Dunlop for the goalkeeper’s jersey and quickly took over as Catterick‘ s number one. In the Championship winning 1962-63 season West, aged just 19, took over, playing in 38 matches to Dunlop’s 4. One of the four games West missed was the title-clinching 4-1 success over Fulham on the final day when injury kept him in the stands. 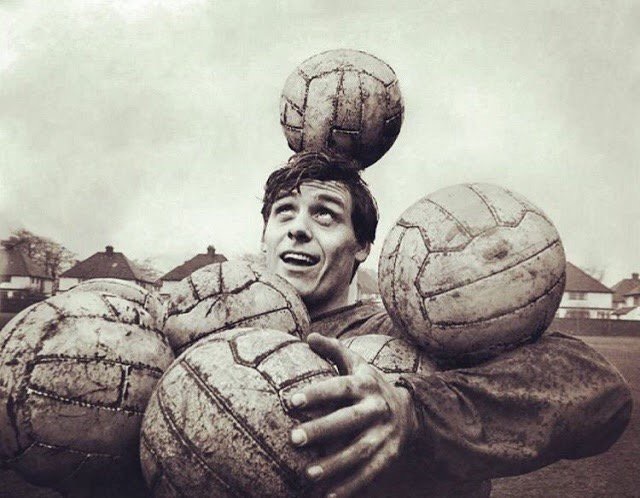 In a period when English football seemed packed with top-class goalkeepers, West proved time and again that he was right up there with the best with excellent positioning and distribution allied to his fine shot-stopping skills. Despite ongoing weight problems he kept himself in top condition. Along with the weight issues, West also suffered quite severely with nerves. “9 times out of 10 he would go and be sick before games”. recalled teammate John Hurst. He was a firm fan favourite and seemed to enjoy a rapport with Goodison supporters although he once ran the risk of falling out with them. After making a mistake and receiving boos from Everton supporters he flashed them a ‘V’ sign which resulted in him being dropped but he soon won them back over. 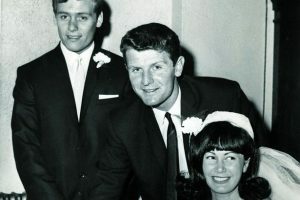 He also proved popular among his teammates and was particularly close with centre-half and captain Brian Labone (they were Best Man at each other’s weddings) and they were described as ‘like Morecambe and Wise when they got together’ by former teammate Jimmy Husband. West also used his good nature to get referees ‘onside’. “I remember the way he could kid referees into awarding free kicks in his favour in the penalty area” former teammate Howard Kendall would later recall. He certainly lived up to the character of great goalkeepers. “All goalkeepers are mad but he was the maddest”, said another former teammate Alan Whittle. “In training he played in the outfield during 5-a-sides and he thought he was Joe Royle, Alex Young and Dixie Dean all rolled into one”. His popularity even extended to fans of Everton’s biggest rivals and he was once presented with a handbag by a Liverpool supporter. 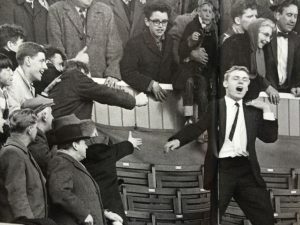 When first appearing in front of the Kop he was greeted with a barrage of two-fingered gestures and his response on his second appearance was to blow kisses and mimic dropping his shorts. The following season a fan dashed out of the Kop and offered him a handbag with the name ‘Honey West’ printed on it. Throughout the 1960s Everton were undoubtedly one of the country’s top teams. They finished outside the top six just once during this period and West was a major factor in the continued success. 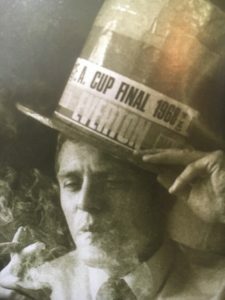 FA Cup honours came with the famous ‘2-0 down, 3-2 up’ game against Sheffield Wednesday in 1966 whilst they were runners-up in 1968 and a further Championship trophy followed in the 1969-70 season where he was ever-present and kept a clean sheet in exactly half of the club’s 42 league games. West was one of only three players to take part in Everton’s two title successes seven years apart with Catterick having rebuilt the team around him, the aforementioned Labone and John Morrissey. 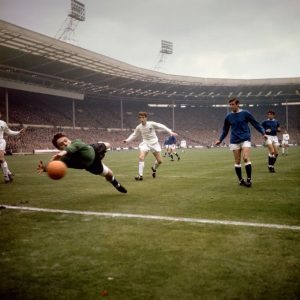 A meagre total of three England caps can be explained in part by the presence of Gordon Banks and others at a time when England was rich in goalkeepers. Then, when he had the chance to go to Mexico as Banks’ understudy he turned it down saying; “I get homesick if I’m away a long while”. It was later revealed that he was going through a divorce at the time. 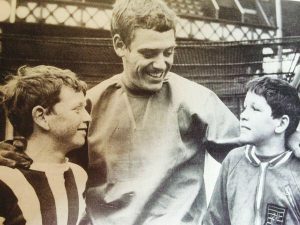 When Everton manager Harry Catterick signed England Under-23 goalkeeper David Lawson from Huddersfield Town for £80,000 in 1972 is seemed to signal the end of West’s time as the club’s number-one and he duly retired soon after at the scandalously young age of 30 having made over 400 appearance for the club. West made a brief comeback with Tranmere Rovers in the late 1970s but finally hung up his gloves for good in 1979. The self-styled ‘Scouser from Barnsley’ went on to work in security at an RAF base but fell on hard times (Harry Catterick had denied him a testimonial at Everton claiming the club had already forked out enough in buying him) and at one time he had to pawn his medals to keep afloat. The Everton Former Players’ Federation got the medals back and also paid for urgently-needed knee surgery and he was welcomed back into the Everton fold. He started attending Q&A evenings and other events that he had avoided partly because he was ashamed to have fallen on such hard times and partly because of his ballooning weight (he reportedly once went to scale at 26 stone having been around 14 stone in his playing days). When asked at one of the Q&A evenings who he thought was the better ‘keeper of him and Neville Southall he replied, with his usual wit; “That’s easy. I was better in the 60s and Nev was clearly better in the 80s”. 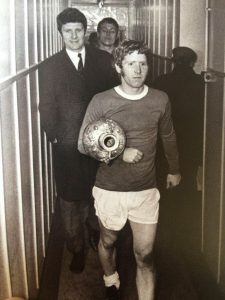 Asked to compare the two title-winning Everton sides he played in and pick which was best, West said; “The 1969-70 title-winning side with Bally in it. They were all good sides but that one was fabulous”. On the help he received from the Former Players’ Federation, West said; “For 30 years I was a nobody. I was finished, forgotten. “They gave me back my life”. West was diagnosed as suffering from cancer and died in hospital in 2012. 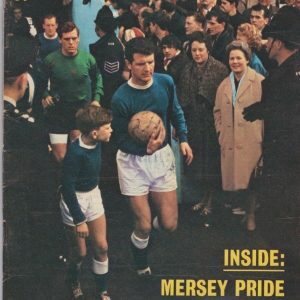 His funeral, at Liverpool’s Anglican cathedral was attended by many ex-teammates as well as Everton players from before and after his time at the club, who formed a guard of honour. West, who was inducted as an ‘`Everton Giant’ in 2008 was adopted by Liverpudlians as one of their own despite his Yorkshire roots. 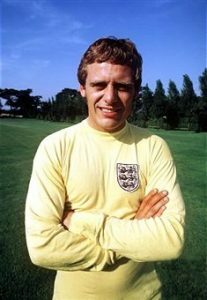 The high regard he was held in by all in in the game shows the true footballing greatness of a man who ‘won it all’ domestically and who proved over a long period that he was one of the country’s finest.